It isn’t every day that artist’s equipment takes centre stage in one of the biggest fine art galleries in the country. Usually, the posters – emblazoned with a big name in that legendary Tate font – draw us in with a recognisable and prominent piece of art, compelling you to save the date in your diary. On this occasion, however, there is no single piece of work that is perhaps instantly recognisable to the wider audience, and the artist’s name does not immediately call to mind familiar visuals. 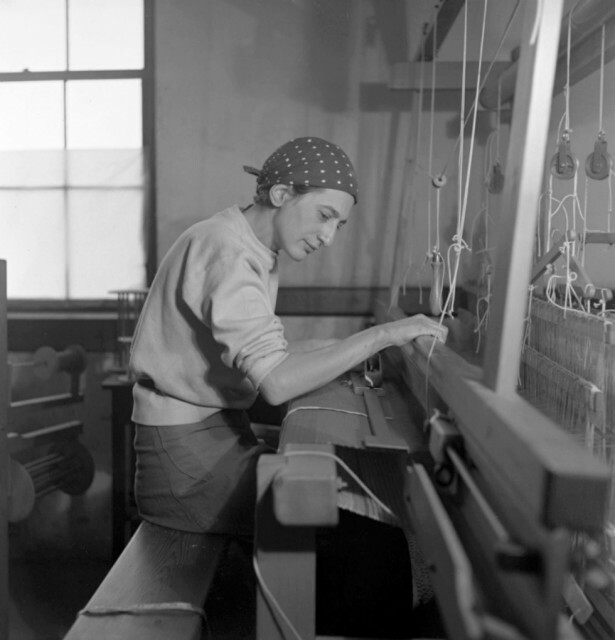 Anni Albers, an artist-weaver, a master-weaver and a general guru in the business of weaving is the star of the current show. The decision to show Albers’ work is an unusual one, because she was a virtuoso in what is often framed as a very traditional craft. Weaving, with its long history and multiple functions, hasn’t changed all that much over the centuries. 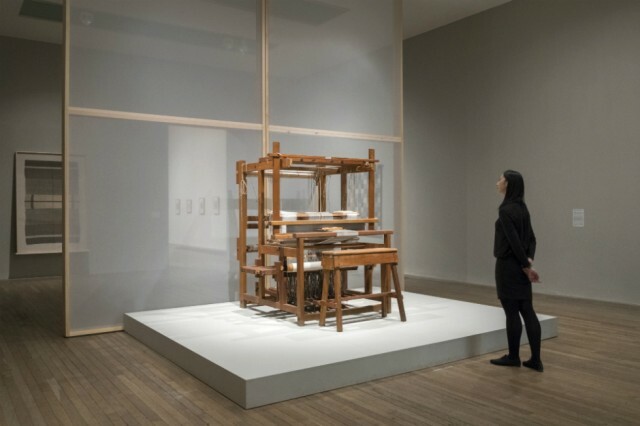 Although there are no obvious criteria for what defines art or craft, weaving has rarely been a technique of choice in the field of visual arts as a whole. Occasions to celebrate craft in a fine art space are hard to come by, and often the closest we get to it is admiring the ‘craftsmanship’ of a perfectly executed perspective painting, or an impressive life-size sculpture, both of which are commonplace in a gallery. So what happens when we go to Tate Modern to see an exhibition and the first thing we encounter is… a loom? Wonderful things, of course. This particular loom, which once belonged to Anni Albers, stands proudly in the middle of the first room of the display surrounded by beautiful textiles of reserved colours warming up the pastel walls. Albers is now best known for her seamless integration of abstract modernism and the woven form, the unforgiving conceptualism realised with the sensuality of touch, and the exhibition succeeds at displaying the artist’s unyielding efforts to fuse both. Although many of the pieces are behind glass, there is a regular rhythm of beeping alarms as one by one the visitors get that little bit too close to a piece, wanting to work out the complicated ties and knots for themselves. It’s impossible not to lean into the exceptionally tactile wall hangings, with our eyes being the only part of the body permitted to rest on and caress the textures. Her final project as a student summarises both the concerns of the modernist school and Albers’ approach to combining function and aesthetic. The shimmering design for a wall-covering material for an auditorium was created to muffle sound and reflect light. It encompasses the importance of a strong skill set and an intimate understanding of the material that is often crucial for innovation, especially in the case of the handmade. Indeed, Albers never stopped exploring new possibilities and, while initially these textiles had a clear functional purpose, later in her career it allows for experimentation in different directions. When the Bauhaus closed in 1933 due to pressure from the Nazis, she had already been married to the painter and tutor Josef Albers, and the pair were invited to teach at the newly opened, experimental Black Mountain College in North Carolina. It was here that she clearly saw the potential of thread to become a medium for creating art and dissolving the formal limitations of craft. 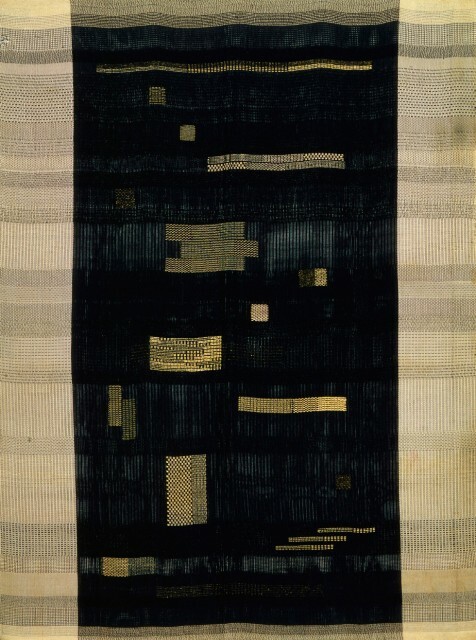 Albers’ pictorial weavings are clearly discernible from her more architecturally-focused pieces: they are smaller and complex, transcending the horizontal-vertical grid that all weaving relies on. Her thinking is demonstrated through one of the most simple yet wonderfully effective techniques: leaving an area of plain weave around the main decorative image so that right away it would be framed like a photograph. In fact, this definitive shift in focus from the ‘domestic’ and usable, to art with the purpose of being exhibited, is a key moment in the story of Albers’ oeuvre as well as the history of textiles and their role in women’s lives. There have been numerous studies on the subject, some inspired by the rising interest in DIY culture; others by the age-old phenomenon of such distinct differences in numbers between male and female textile artists. Are women drawn to thread or are they pushed towards it? There is no clear answer. However, we can conclude that historically, most cultures saw textile-making – with the purpose of clothing, softening, creating shelter, warmth and decoration – as a central aspect of the female domain, often happening in domestic settings. Although over time this may have diminished due to the automation of textile production processes on a larger scale, and the connotations of soft materials with oppressive social constructs, there remains very large numbers of female fibre artists creating today. Perhaps the key difference is that they are no longer creating to clothe their family, but with a clear aim of exhibiting their work in the public realm, and selling it as art. With an abundance of online platforms and their growing creative communities, the distinction between art and craft has become blurry, less relevant; yet this could only have been achieved with somebody having initiated a small revolution in the way craft is perceived. It’s safe to say, Anni Albers paved the way. She continued to design and produce textiles in all their forms and was greatly inspired by the textiles of ancient Peru, which express her interest in text and thread as a form of communication. Her piece, Ancient Writing, borne out of trips to South America, is one that you can’t quite walk away from, revealing more and more minute patterns the longer you look. Albers didn’t stop at weaving either, having written books, produced drawings, prints and embossings, all with a confident hand and all stemming from the desire to understand thread and its possibilities thoroughly and completely. 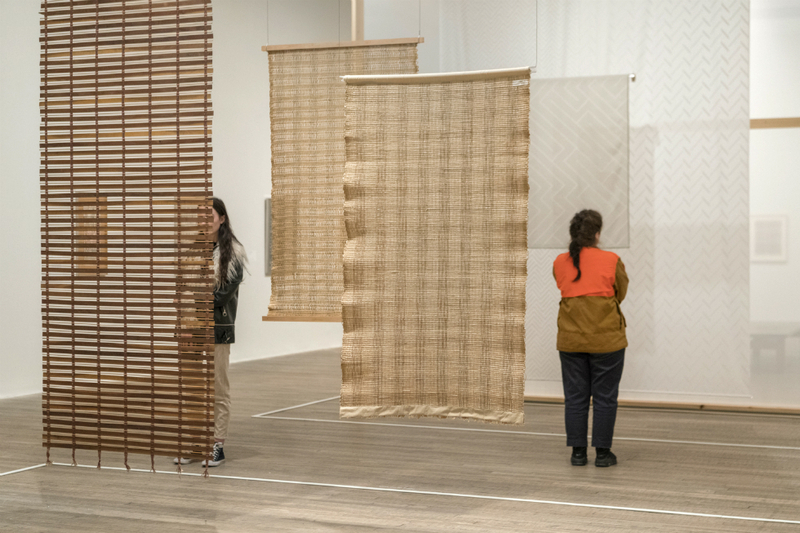 For those who long for a truly haptic experience, the final room of the show gathers together all of the materials used in Albers’ weavings, which visitors can run their hands through, accompanied by a three-panel process video. Indeed, the decision to include these multisensory stimuli here was the correct one, limiting the distractions throughout the show to a minimum. Anni Albers’ work, ideas and methods deserve our absolute attention. Patience, like time, is a valuable commodity and weaving is a technique possessive of both.